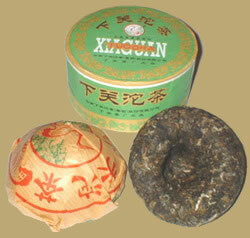 Xiaguan Tuocha was developed for the first time at Xiaguan in 1902 with a registered brand called "Songhe", which has a crane under a pine tree for trademark. The product is prepared with extra care by using leaves from the different tea mountains famous for the improved broad-leaf tea species. The tea is of a bowl-shaped mass of leaves, regular in shape tightly-compressed, with shinny luster and strong scent. It's liquor looks bright yellow, taste refreshing and sweet in aftertaste.